Total employment in Canada grew 20% between 1998 and 2007, with the highest growth occurring in occupations that require higher levels of education, such as natural and applied sciences and related; health; social science, education, government service and religion; art, culture, recreation and sport. These occupations are usually referred to as knowledge occupations. Women's employment grew 24% over the decade, compared with 16.8% for men. 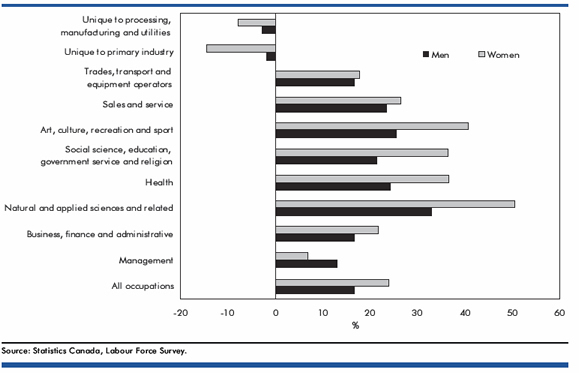 Their labour force also increased (21% compared with 14% for men). But women's employment growth in knowledge occupations was even more impressive: led by an almost 51% increase in natural and applied sciences and related occupations, followed by art and culture (40.8%), and health and social science, education, government service and religion (about 36%). These occupational employment trends reflect women's predominant share of university degrees, which has outpaced men's since the early 1980s. Women made less progress in management (their employment increased less than 7% compared with 13% for men), but surpassed men in business, finance and administrative occupations (22% compared with 16.5%). Knowledge workers in Canada's economy, 1971-2001, Statistics Canada, October 2003. Dimensions of occupational changes in Canada's knowledge economy, 1971-1996, Statistics Canada, October 2003.